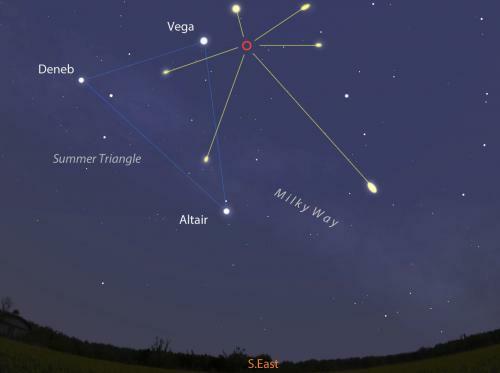 The June Lyrid meteor shower is coming. This shower is active during June 10 to 21, producing predominantly blue and white meteors at a maximum hourly rate of 8 per hour on June 15 (λ=84.5°). At maximum the radiant is located at α=278°, δ=+35°. 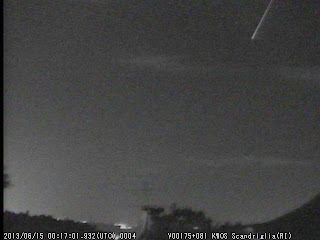 The average observed magnitude of this shower is near 3, while about 32% of the meteors leave trains. This meteor shower was discovered on the evening of June 15, 1966, by S. Dvorak (California, USA) while camping out in the San Bernardino mountains. His attention had been drawn to the region of Lyra by a very bright meteor that moved swiftly to the northeast through that constellation. Another meteor was noted a short time later and Dvorak began plotting additional meteors. After 1 1/2 hours he had managed to plot 16 meteors, of which 13 appeared to originate from a hitherto unknown radiant located at RA=278°, DECL=+30°. Just a few hours later, F. W. Talbot (Cheshire, England) independently discovered the radiant at RA=275.5°, DECL=+30°, and noted an hourly rate near 9. Moonlight from a waning moon interfered with observations in 1967, but, in June 1968, confirmation of this shower's existence came from Richard Nolthenius (Hacienda Heights, California). 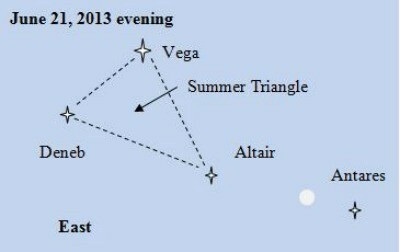 During one hour on the 15th, he detected 8 June Lyrids, while a similar hour on the 17th revealed 7. Observations of this shower have continued annually ever since, however, to date, the most elaborate study of this shower was made from observations obtained during 1969. Observations from 46 observers, totalling 172 man-hours, were gathered and analyzed by Keith B. Hindley of the British Astronomical Association. The observations covered the period of June 11.5 to 21.0 (Solar Longitude=80.2 deg to 89.2 deg) and the total number of June Lyrids observed was 363. Against a fairly constant sporadic meteor rate of 8.7 per hour, the June Lyrids displayed a broad maximum of about 6 per hour during June 13 to 17, with a sharp peak of 9 per hour on June 16.0 (Solar Longitude=84.5 deg). The average magnitude was found to be 2.0 and 32% of the shower's meteors showed persistent trains. Colors displayed a prominence of white, as did sporadic meteors, however, there was also a large number of blue meteors. The exact percentages of colors seen among the June Lyrids were as follows: 33%, blue, 52%, white, 9%, yellow, and 6%, orange-red. The average radiant, as determined by Hindley, was found to be RA=278 deg+/-2 deg, DECL=+35 deg+/-3 deg. From this position, a parabolic orbit was calculated, which revealed a close, but "not convincing" similarity to comet Mellish (1915 II). This comet possesses a slightly hyperbolic orbit with an eccentricity of 1.0002. A radar orbit obtained by Zdenek Sekanina from observations made at Havana, Illinois, in 1969, actually seemed to strengthen the similarity between the June Lyrids and 1915 II, except for the fact that the radar orbit revealed a period of 2.94 years. These orbits are compared later. maximum peaks of 1.3 to 3.5. The radiant of the stream was determined from 37 meteors plotted by an Ottawa observing group from observations made during June 14 to 17, with the result being RA=278.3 deg, DECL=+41 deg. In 1972, the shower again showed a poor return. Meteor News combined the observations of 20 observers, made during June 9 to 22, and found the maximum ZHR to be only 2.3---a value that came on June 15/16. What the observations also revealed were activity levels between 1.2 and 1.3 during June 12 to 15, which suddenly jumped to 2.3, then rapidly fell to only 0.3 by the night of June 18/19. Thus, the shower's date of maximum and variation of activity levels closely reflected those noted in 1969, but the ZHRs were typically down by about 6 or 7 meteors per hour! Observations in 1974 indicated a resurgence of activity. The shower's discoverer, Dvorak, observed on four nights during mid-June, with the following average hourly rates (not ZHRs) being noted: June 14/15, 2.9, June 15/16, 6.5, June 16/17, 6.2, June 17/18, 2.3. Dvorak added that the meteors moved swiftly, with the majority being bluish-green. Also, in 1974, Nolthenius, Alan Devault and Bob Fischer (all of California) observed during 7 nights between June 9 and 22. Overall, they observed 32 June Lyrids, with the average magnitude being determined as 3.09. Slightly less than half of their total number of June Lyrids were seen on the shower's night of maximum (June 15/16). The average number of meteors seen from this radiant was 4 per hour. During 1975, observations were quite scarce. Between June 6 and 15, Norman W. McLeod III (Florida) saw only 2 June Lyrids, while, during the period June 9 to 14, Mark Adams (Pennsylvania) noted 5 members, with 4 coming in less than 3.5 hours on the final date of observation. 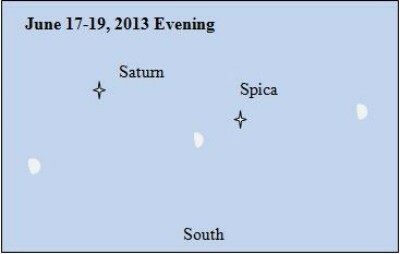 Finally, Paul Jones (St. Augustine, Florida) observed for 3 hours on the night of maximum and detected 20 June Lyrids. Interest in the June Lyrids seems to have waned in the latter half of the 1970s and into the 1980s, with only a few individuals continuing to monitor the shower annually---many of them rarely observing around the time of the shower's established date of maximum. As is evident from the previously listed observations, activity from this radiant can be virtually nonexistent on dates other than June 15 and 16, due to the June Lyrids' very pronounced peak of activity. A search for pre-1966 observations of this shower has not revealed many clues to the shower's history. From observations by G. Zeziolli, G. V. Schiaparelli isolated 11 meteors observed on June 14, 1869, from a radiant of RA=280 deg, DECL=+35 deg. 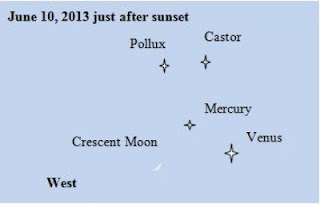 No convincing June Lyrid radiants were observed by members of the American Meteor Society prior to 1966, nor were any observations present among the extensive visual radiants obtained by A. S. Herschel, A. King, C. Hoffmeister or E. Opik. Aside from the 1969 study by Hindley, studies of the June Lyrids have been rare, with the only other information gathered on the individual meteors involving the average magnitude. John West observed 59 June Lyrids during 1967 to 1982, and found the average magnitude to be 3.02. During 1967 to 1981, R. Hill (North Carolina, USA) observed 65 June Lyrids and found the average magnitude to be 2.71.